Patriarch of the Sartain family, Considered the ‘father of mezzotint engraving’ in the United States. SAMUEL SARTAIN: (1830-1906) became a master printmaker under his father’s tutelage. As artists, printmakers, and educators, the Sartains played a central part in Philadelphia’s and America’s art community. 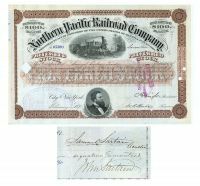 1876, Northern Pacific Railway Stock certificate for 7 shares issued to and signed by two members of the most illustrious and influential families in the history of art in the United States, Henry Sartain. Attractive certificate with ornate border, vignette of a train passing by telegraph lines in the countryside and a lower vignette of Fredrick Billings. Brown/Black. Signed on verso: "Samuel Sartain, Trustee." Under this is the signature of his father: John Sartain. JOHN SARTAIN: (1808-1897)Patriarch of the Sartain family, Considered the ‘father of mezzotint engraving’ in the United States. SAMUEL SARTAIN: (1830-1906) became a master printmaker under his father’s tutelage. As artists, printmakers, and educators, the Sartains played a central part in Philadelphia’s and America’s art community. ***Punch hole cancellations not affecting signature. On the scrip stub attached, Samuel has signed his name again, as Trustee for William Sartain. Very Fine.